by Chris Woodford. Last updated: October 31, 2018. Do you ever hear people talking about using a sledgehammer to crack a nut? Using too much force where only a little would do is obviously a waste of energy—but it's something we all do, all the time, where electricity is concerned. Broadly speaking, voltage is the electrical equivalent of force and we often power electrical appliances and gadgets with far more volts than they actually need. Using an "electric sledgehammer" to crack an electrical nut wastes money as well as energy and can dramatically shorten the life of expensive equipment. If you're running something like a factory with lots of huge machines powered by electric motors, using too much voltage might be adding an unnecessary 10–20 percent to your electricity bill; multiply that across the whole of the industrial world and you get a big problem that's bad for the economy and bad for the planet. One solution is to use voltage optimization equipment (also known as voltage correction, stabilization, or reduction), which constantly regulates your electricity supply so you get precisely the voltage you need. Let's take a closer look at how it works! Photo: The concept of voltage optimization: it converts power-line waves of different shapes and sizes into ones of just the right shape and size to run your equipment more efficiently. Ever noticed that all the little gadgets and gizmos you have around the house use slightly different voltages of electricity? Your big appliances are all designed to run off the household supply, typically 110 volts or 230 volts depending on where in the world you are. But the smaller gadgets will use all kinds of different voltages. A flashlight will use about 3 volts, a digital camera 4 volts, a cellphone or CD player 6 volts, a laptop about 20 volts, and so on. Ever wondered why bigger appliances need more? Think voltage, think force: broadly speaking, you need a bigger voltage to force an electric current through something like the electric motor in a refrigerator or a vacuum cleaner than through the tiny little filament lamp in a flashlight or the microchips in your laptop. You need a bigger sledgehammer to crack a bigger nut. Photo: Power plants are designed to produce reasonably constant voltages with voltage regulators, ammeters, wattmeters, synchroscopes (which keep power generators in sync with one another and the power grid they're connecting to), and much more. 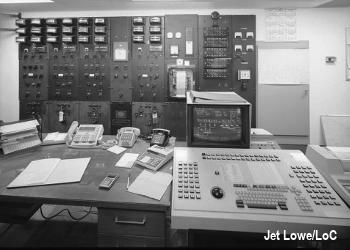 Photo of power regulating equipment in a control room at White River Hydroelectric Project by Jet Lowe, courtesy of US Library of Congress, Prints & Photographs Division, Historic American Engineering Record. Once electricity leaves a power plant, utility companies have little or no idea what we're actually doing with it. They just give us all the same basic supply and let us get on with it. In practice, industrial users will get much higher voltage supplies than homes so they can drive powerful factory machines but, even so, there is only a relatively crude link between the voltage that's supplied and the voltages we actually use. The mismatch between these two things can be a big problem and a huge waste of energy and money. Most electrical machines are made and sold internationally and have to work on different voltages in different countries. An electric lathe (factory cutting machine) might be manufactured in Germany to work right across Europe (a huge swathe of the world) on voltages ranging from 200–250 volts: in Germany, it'll happily work on 230 volts; in the UK, it'll work just the same (no faster or better) on a national supply that's sometimes closer to 240 volts—but the higher voltage will make it waste about 10 percent more energy by getting considerably hotter (potentially reducing its useful life quite significantly). If you're using that machine in the UK, you might wish your electricity supply were 230 volts instead of 240. This problem is often referred to as overvoltage. 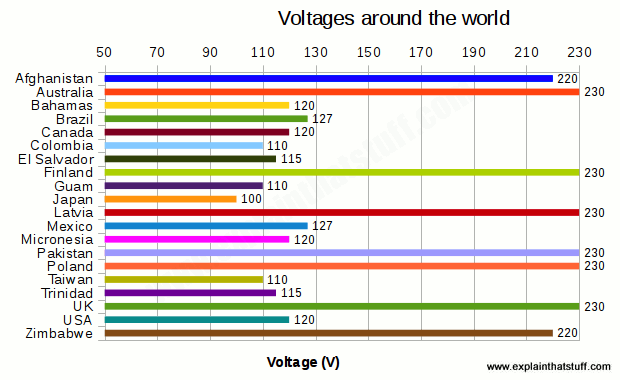 Chart: Voltages around the world: As all travellers know, electricity supply voltages vary around the world, though generally there are just two common bands: roughly 100–130 volts for North America and the Pacific and 220–240 volts elsewhere. That's obviously a problem for manufacturers who want to make products for the global market, but less of a problem in a single continent, such as Europe, where voltages have been standardized. Source: Mains electricity by country (double-checked with a second source). There are some other issues to worry about too. The voltage your building receives can rise and fall quite dramatically from hour to hour (even from minute to minute or second to second) due to fluctuations in demand and supply. If a factory is turning big electric machines on and off in your neighborhood, for example, that can lead to transients (brief spikes) in power that can affect other buildings nearby. Spikes (sometimes called surges) and sags (sometimes called dips) can also be caused by lightning strikes, power generating equipment going on- or offline, and lots of people all using electricity at once (cooking at the same time each evening, for example). In practice, a supply that is supposed to be 230 volts could be fluctuating regularly by as much as 10 percent or more, giving you an actual voltage anywhere from about 210–250 volts. And it's not just the voltage that can vary. In theory, most electricity is supplied as an alternating current (AC) sine wave, which rises, falls, and reverses direction smoothly something like 50-60 times a second (the ordinary supply frequency). In practice, AC supplies can also include irregular, higher-frequency waveforms called harmonics that potentially damage delicate equipment (by causing overheating) and really need to be filtered out. Photo: Ideally, alternating current should vary smoothly in this up-and-down sine-wave pattern. In practice, it can change more drastically and erratically, harming your equipment. As householders, we don't mind all this too much; most of us aren't even aware of the problem. Like me, you're probably used to having lots of little gadgets (laptops, cellphones, electric toothbrushes, and so on) all with built-in transformers that convert the ordinary power supply (nominally ~110–120 volts in North America and the Pacific region and ~220–240 volts in Europe and elsewhere) to the correct voltage in each case (15 volts for the laptop I'm typing on, for example). And maybe you have surge protectors fitted to a few key appliances (like your computer or your wireless router) to safeguard against spikes and lightning strikes. If you're running a business, the mismatch between the voltage you're supplied with and the voltage you need is much more of an issue: it's costing you a great deal of money you don't actually need to spend. 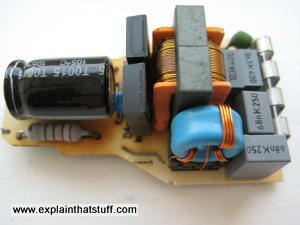 Photo: Electronic household gadgets that use low voltages typically have small transformers built into their power cords. These all run off the European power supply of 230 volts or so, but actually supply much smaller voltages to the appliances they power. 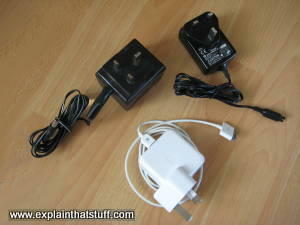 Clockwise from the top: transformers for a modem (18 volts), a cellphone charger (5.9 volts), and an iPod charger (12 volts). How does voltage optimization work? There are two main ways to solve the problem. The first is to have your own, simple step-down transformer (also called a voltage-reducing or "tap-down" transformer) to change a higher incoming voltage to a lower level more in line with what you actually need. Factories and offices with their own dedicated substation or transformer effectively have this option already; they can simply readjust what's called the "tap setting" (the ratio between the incoming and outgoing voltage) so their transformer supplies a lower voltage than before. Alternatively, an extra step-down transformer can be added to reduce the voltage from the outside electricity supply to one that more closely matches what's needed by the building's internal electricity system. The trouble with this approach is that it solves only the problem of overvoltage. If you're sometimes getting too little voltage from the supply (a problem also called "undervoltage" or "brownout"), altering the tap setting to reduce overvoltage will make matters worse. 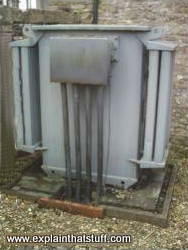 Photo: A step-down transformer like this one (which is supplying my electricity as I type this) reduces the high-voltage power from electricity cables into a lower voltage for homes and factories. Adjusting the tap settings will make it produce a higher or lower output voltage from the same input voltage. A better solution is to use dedicated voltage optimization equipment that constantly adjusts the voltage from the supply, either increasing or decreasing it so it remains within a narrowly defined band. Devices that do this are called voltage regulators, voltage optimizers, voltage stabilizers, or voltage correctors. They need no maintenance or monitoring and work happily for many years without replacement. They also filter out spikes and harmonics to give a smoother power supply all round. Other voltage regulators work a different way. The simplest ones are essentially electronic. They work by constantly measuring the voltage of the waves that make up the incoming electricity supply and comparing them with the voltage you say you want. If there is too much voltage, they add a second wave of just the right size, in antiphase with the original, to subtract exactly the right amount of voltage. So if your incoming supply rises to 250 volts and you'd set the regulator to 220 volts, it will add an upside down waveform equivalent to 30 volts to the 250 volts, subtracting just enough power to make 220 volts. If the supply dips to 240 volts, the corrective voltage will immediately dip to 20 volts, keeping the output steady at 220 volts. A voltage regulator is usually a more expensive solution than a simple step-down transformer, but it can save half as much energy again, giving overall energy savings of 10-20 percent. Although large units cost thousands of dollars or pounds, typically, they pay for themselves in 2-3 years (in lower energy and maintenance costs and by extending the life of the electrical equipment they're connected to). They also have a payback for the planet: by cutting your energy consumption, they're helping you make a positive contribution to tackling environmental problems such as climate change. Photo: You might think all your household electrical appliances are running off a 110-volt or 220-240-volt supply, but many of them secretly transform that voltage to something else without your knowing. A little circuit like this is built into the base of modern energy-saving fluorescent lamps (also called compact fluorescents or CFLs). 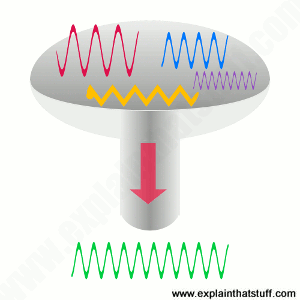 It boosts the frequency of the supply so the lamp can be small, bright, and compact and so it doesn't flicker. Voltage optimization equipment is sophisticated and used to be beyond the budget of all but big businesses and industry. But small, vastly scaled-down versions of the same basic equipment are now being mass-produced for ordinary householders. One small voltage optimization gadget, manufactured by VPhase, promised to reduce household electricity supply from 240-250 volts (potentially fluctuating from 200-250 volts) to a more consistent level around, say, 220 volts, offering a potential saving of 10 percent on electricity bills. Smaller voltage optimization units typically don't protect against transients and harmonics, however and they have been criticized by consumer group Which? for costing too much and taking too long to pay for themselves. Ultimately, there are simpler, cheaper, and quicker ways of reducing your household energy bills, some of which (like turning down your thermostats very slightly) don't cost anything at all. Same output, lower input—voltage optimization sounds too good to be true. Indeed, it sounds like it violates one of the most basic laws of physics: the conservation of energy. According to that law, you can't make energy out of thin air or get more energy out of something than you put in. So if you reduce the energy going into an appliance, aren't you going to get less energy out? Or, to put it another way, if voltage optimization lowers the voltage, doesn't it make something like an industrial motor slower and less effective? Won't it make something like a refrigerator or an air conditioner less effective at cooling? Won't it make your lights dimmer? The answer is sometimes yes, sometimes no. Remember overvoltage, which we introduced above? If you supply something like a motor with more voltage than it needs, it doesn't spin any faster: it just wastes the extra energy as heat. Reduce the voltage and you reduce that wasted heat before you reduce the useful energy that turns the motor. In other words, if you run the motor at its ideal, lower voltage, you make it more efficient. The energy you save in this way is energy you're not drawing from the power supply, so it translates into a financial saving (for you) and an environmental benefit (for the planet). It's worth remembering that if you run appliances with too much voltage or current, they'll wear out significantly more quickly. Extending the lives of electrical appliances also translates into financial and environmental benefits. Now it's worth pointing out that if you cut the voltage too much, you are bound to reduce the output of whatever appliance you're powering: the conservation of energy tells us that must be the case. Consider an extreme example and this is intuitively obvious: you cannot run a 220-volt domestic refrigerator with a 1.5-volt battery, simply because a battery with that low a voltage can't supply enough energy to power a motor that big. In other words, there is a limit to how much you can cut voltage without cutting useful output. So what is the limit? Some manufacturers of voltage optimization equipment claim that our everyday voltages are perhaps 10–20 percent too high for the appliances we use, which suggests you can safely cut the voltage you supply by perhaps 10–20 percent without sacrificing any useful output from an appliance. This is misleading. The reality is much less clear-cut and depends on what kind of appliances you're supplying, how they're loaded, and how much you try to reduce the voltage. It's certainly possible to save energy and money with voltage optimization, but you might well reduce the effectiveness of whatever you're powering at the same time. Will the lights get dimmer with voltage optimization? For many types of lights, there is a roughly linear relationship between the voltage you supply and the light they produce (luminous output); reduce one and you are bound to reduce the other. Think of how a simple flashlight (torch) bulb gradually gets dimmer as the battery loses its charge. What's actually happening (though it's not obvious) is that the battery is slowly losing its voltage (typically from about 1.5 volts, when new, to around 0.5–1.0 volts when it no longer does anything useful) and the lower voltage means less light. Interestingly, for some types of lights, there is also an inverse linear relationship between voltage and lamp life, so the lower the voltage, the longer the light lasts. Now maybe your lights will be a bit dimmer with voltage optimization—and maybe that doesn't matter if your building was too bright to start with or the potential cost savings (through lower power bills and longer-lasting lamps) are more important to you. The Environment Agency—simple rules, clever kit by Simon Beavis, The Guardian, 26 May 2011. Explains how the British Environment Agency used voltage optimization and other technologies to cut its energy consumption. Understanding voltage optimization: Simon Redford has an interesting page that explains why voltage optimization typically does reduce the quality of service, and not simply energy losses as we might assume. Note the interesting graph showing how voltage optimization reduces the illumination from fluorescent lighting. Voltage optimization case studies: powerPerfector, one of the manufacturers of voltage optimization equipment, has quite a few interesting, detailed case studies, including grocery stores, government departments, and universities. Apollo Enviro Case Studies: There are several interesting case studies at the bottom of the page. iVolt Systems: Case Studies: More case studies! US Patent 20140265574: Management of energy demand and energy efficiency savings from voltage optimization on electric power systems using AMI-based data analysis by Stephen J. Tyler, Phillip W. Powell, Dominion Resources, Inc. September 18, 2014. A sophisticated computer-controlled voltage optimization system. US Patent 20130134802: Apparatus and method for use in transferring an electrical power supply in order to bypass a transformer based voltage optimization device by David Taylor, EMSC (UK) Limited, May 30, 2013. Describes a device that can bypass a modern voltage optimizer during maintenance. Electrical Energy Efficiency: Technologies and Applications by Andreas Sumper, Angelo Baggini. John Wiley, 2012. Residential, Commercial and Industrial Electrical Systems: Equipment and selection by Hemant Joshi. Tata McGraw-Hill Education, 2008.